Well I have begun to build me a NEW Super Modifed. Its gonna be a slow build. It is legal for ARMA in 09 one of thier new classes. IT will be legal for the WOO candian club. I plan on going up their at least once a year. I mounted the rear axle and an adjustable wedge I want to to try to use. Not sure If I can or will but its there for now. This will be an unconventional build, as per ARMA sanctioned class build in 3 ways. It will be 2" off the ground, 42" inches wide and have an offset of 4" meaning center of frame to left outside sidwall 19" and right side 23". It will have a vertical motor, 700 trans, standard type clutch and for now I will use mowers tires on the rear and Kart grooved on the front. Below are pics of the start. Here are the new wheels. I am not 100% liking the hub. Reckon I will get with Carroll about making some beefier ones. This is a look from the rear. 1.85" ride hieght. Not much but its a start. Here is a closer look of the fenders. George, what is a transmatic? looking good george! ive been lurkin around on the boards for a few days now, and im definitley a fan of what you and everyone else on this board have accomplished!!!! Rock on! Have you concidered doing a suspended mower? i dont know if youve ever seen a quarter midget but the suspension would transfer over very niceley, axle and all. I have seen quarter midgets very nice rides. We are not alloweed suspension on ours so that has never been a thought. Looks pretty sweet so far George. 2007 Troy Bilt Grand National Super Modified Champion. 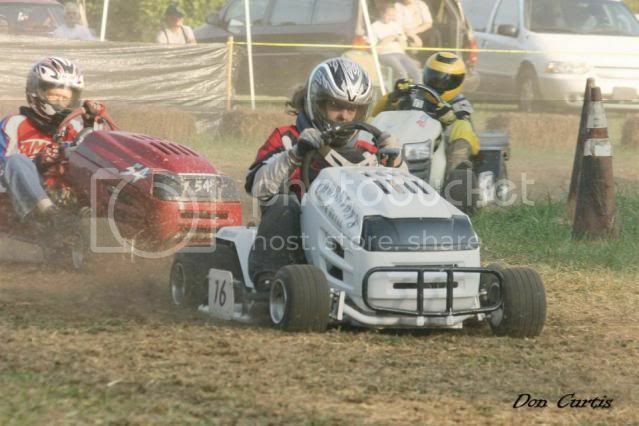 2008 WOO Outlaw/FXT class Champion. 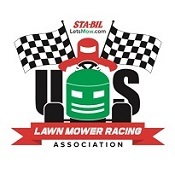 2008 All American Lawnmower Championsip Outlaw twins champion. 2010 WOO Outlaw/FXT class Champion. Looks good, like the wedge idea! But concerned with the bolt for making the adjustment. I don't think that bolt will take the abuse. Heres an idea. Make a cam for the wedge to hold the wedge in place and make a positive locking handle. Like a shifter type. Move the handle that goes into a slot and can't come out unless you unload the wedge and pull the handle over. I assume you are planning on adjusting it on the fly is why you are using a bolt. No worries I scratched the idea of using it on this chassis My size required a seat so wide I don't have room for it. I am going to applyi it to another chassis I am planning. The leaft rear has the least pressure. It worked on a dirt kart well with the bolt. I know there is a difference in weight and trak types but I think it will work. Just no on this chassis. Am i missing something? I have read this over and over and dont see anything about a bolt contraption? what are yall talking about? Very first picture arm extending in front of rear tire, with holes in it the bolt on the end of it. It is looking good need some more pics I know you been working on it lol. Have to tell you George you do do a great job building them. but won't fit the budget. Hope things are good at home take care. Thanks Rusty...It was a pleasure having you drive it and racing with you. You ain't half bad. I promise if you follow my build it will drive well. And tech advice is free. So if ya get stick just holler. Remember a GOOD chassis will make any motor look good. As for my build I have got the seat cut into the fenders now and will get pics tomorrow. Havn't been working as hard as I should been under the weather a bit. thats a good idea. it should be a great mower. 2010 Bsmra unkown if i will be around to race. We're on our way up this weekend with a couple goodies. Then he can get back to grind stone with it. Good luck George.